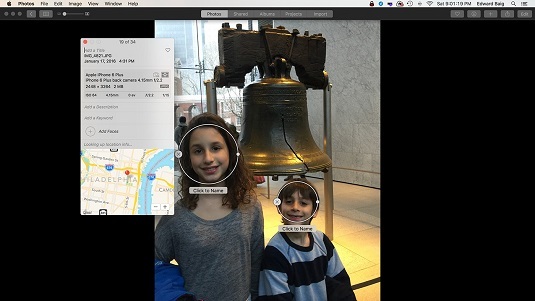 How awesome would it be to locate photos on your Mac based on who’s in them? Your wish is Apple’s command. The magical Faces feature is based on facial detection and recognition technologies. The feature is off by a few whiskers here and there: Photos may fail to recognize a face or falsely match a name with a face. Still, you can’t help but walk away impressed, even if Faces isn’t quite up to CSI standards. When you first open Photos, the program scans your library in the background to find facial matches. It also scans faces when you import new photos. Click the Faces album in the Albums view, or click Faces under the Albums view in the sidebar. When you first get started, you’ll see people’s mugs in individual circles. Double-click one of the faces in a circle to get started. Type the name of the person. 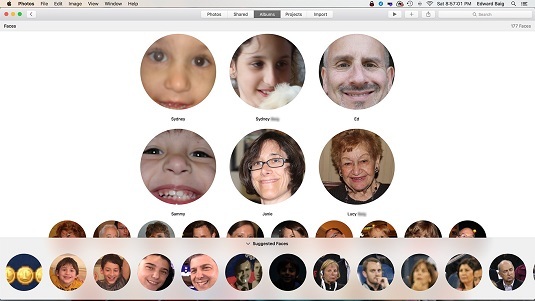 Apple displays pictures with the person whose face it thinks it recognized. The face is circled inside the image. Examine each photo to confirm that Apple correctly matched a face — a check mark should already be in place. If Apple did get it right, click Add and Continue. If Apple didn’t get it right, click the photo to remove the check mark(s) and click Add and Continue. Repeat Step 4 for each photo that Apple has added. When you want to stop reviewing facial suggestions, click Finish Later, and then click Done. The Faces feature in Photos gets smarter as you go along and correctly IDs more pictures. In the Faces view, every person whose face you’ve identified appears in their own circle. If you click the Photos tab in the Faces view, you see all the underlying photos of that person that are represented here. Click the Faces tab in the Faces view to go back to seeing the person’s mug in the circle. If you see suggested faces at the bottom of the screen for a person who has already been identified, drag one or more faces at the bottom onto their circle in the upper portion of the screen. A second way to add new faces is to click the Info (i) button on the toolbar. Doing so summons the Information pane, which is a great source of information about an image, from the camera used to the location in which the pic was snapped. Using the Information pane to identify a face. Examine the picture. If you see an Unnamed label below a face, just type the person’s name — again, if known. If no label appears, click the circled + in the Information pane. Drag the circle that appears over an undetected face, grabbing the corners to make the circle larger or smaller as needed. The position and size of the circle determines the way the circled images look on the Faces page. Click to name the person.